The following biographical sketches of America’s founding fathers are taken from the 1829 book, Lives of the Signers to the Declaration of Independence, by the Rev. Charles A. Goodrich. 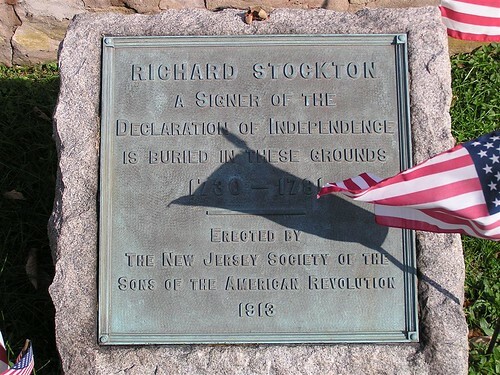 The first of the New-Jersey delegation, who signed the Declaration of Independence, was Richard Stockton. He was born near Princeton, on the 1st day of October, 1730. His family was ancient and respectable. His great grandfather, who bore the same name, came from England, about the year 1670, and after residing a few years on Long Island, removed with a number of associates to an extensive tract of land, of which the present village of Princeton is nearly the center. This tract consisted of six thousand and four hundred acres. This gentleman died in the year 1705, leaving handsome legacies to his several children; but the chief portion of his landed estate to his son, Richard. The death of Richard followed in 1720. He was succeeded in the family seat by his youngest son, John; a man distinguished for his moral and religious character, for his liberality to the college of New-Jersey, and for great fidelity in the discharge of the duties of public and private life. Richard Stockton, the subject of the present memoir, was the eldest son of the last mentioned gentleman. His early education was highly respectable, being superintended by that accomplished scholar, Rev. Dr. Samuel Finley, in a celebrated academy at West-Nottingham. His preliminary studies being finished, he entered the college of New-Jersey, whose honors he received in 1748. He was even at this time greatly distinguished for intellectual superiority; giving promise of future eminence in any profession he might choose. On leaving college, he commenced the study of law with the honorable David Ogden, of Newark, at that time at the head of the legal profession in the province. At length, Mr. Stockton was admitted to the bar, and soon rose, as had been anticipated, to great distinction, both as a counselor and an advocate. He was an able reasoner, and equally distinguished for an easy, and, at the same time, impressive eloquence. In 1766 and 1767, he relinquished his professional business, for the purpose of visiting England, Scotland, and Ireland. During his tour through those countries, he was received with that attention to which he was eminently entitled, by the estimable character which he had sustained at home, and his high professional reputation. He was presented at court, by administer of the king, and had the honor of being consulted on American affairs, by the Marquis of Rockingham, by the Earl of Chatham, and many other distinguished personages. On visiting Edinburgh, he was received with still greater attention. He was complimented with a public dinner, by the authorities of that city, the freedom of which was unanimously conferred upon him, as a testimony of respect for his distinguished character. A short time previous, the presidency of New-Jersey college had been conferred upon the Reverend Dr. Witherspoon, a distinguished divine, of the town of Paisley, in the vicinity of Glasgow. This appointment Dr. Witherspoon had been induced to decline, by reason of the reluctance of the female members of his family to emigrate to America. At the request of the trustees of the College, Mr. Stockton visited Dr. Witherspoon, and was so fortunate in removing objections, that not long after the latter gentleman accepted the appointment, and removed to America, where he became a distinguished supporter of the college over which he presided, a friend to religion and science in the country, and one of the strong pillars in the temple of American freedom. The following instances in which Mr. Stockton narrowly escaped death,. during his absence, deserve notice. While he was in the city of Edinburgh, he was waylaid one night by a furious robber. He defended himself, however, by means of a small sword, and even succeeded in wounding the desperado. He was not materially injured himself, but was not so fortunate as to prevent the escape of his assailant. In the other case, he was designing to cross the Irish channel, and had actually engaged a passage in a packet for that purpose. The unseasonable arrival of his baggage, however, detained him, and fortunate it was that he was thus detained, for the packet, on her voyage, was shipwrecked during a storm, and both passengers and crew found a watery grave. The following year he was appointed one of the royal .In judges of the province, and a member of the executive council. At that time he was high in the royal favor, and his domestic felicity seemed without alloy. He possessed an ample fortune, was surrounded by a family whom he greatly loved, and held a high and honorable station under the king of Great Britain. But the time at length arrived, when the question arose, whether he should renounce his allegiance to his sovereign, and encounter the sacrifices which such a step must bring upon him, or continue that allegiance, and forfeit his character as a friend to his country. Situated as was Mr. Stockton, the above question could not long remain unsettled; nor was it for any length of time doubtful into which scale he would throw the weight of his influence and character. The sacrifices which he was called upon to make, were cheerfully endured. He separated himself from the, royal council, of which be was a member in New-Jersey, and joyfully concurred in all those measures of the day, which had for their object the establishment of American rights, in opposition to the arbitrary and oppressive acts of the British ministry. 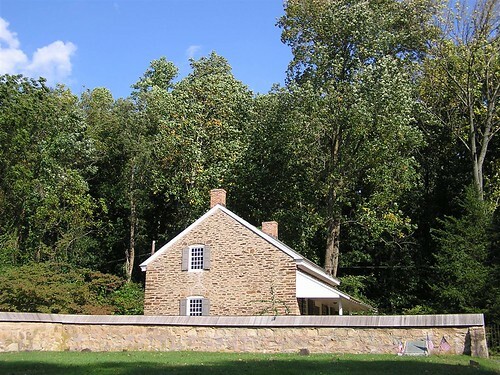 On the twenty-first of June, 1776, he was elected by the provincial congress of New-Jersey a delegate to the general congress, then sitting in the city of Philadelphia. On the occurrence of the question relating to a declaration of independence, it is understood that he had some doubts as to the expediency of the measure. These doubts, however, were soon dissipated by the powerful and impressive eloquence of John Adams, the great Colossus on this subject on the floor of congress. Mr. Stockton was not only convinced of the importance of the measure, but even addressed the house in its behalf, before the close of the debate. It is needless to detain the reader by a particular mention of the many important services which Mr. Stockton rendered his country, while a member of congress. In all the duties assigned to him, which were numerous and often arduous, he acted with an energy and fidelity alike honorable to him as a man and a patriot. Mr. Stockton was at length released; but his confinement had been so strict, and his sufferings so severe, that his constitution could never after recover the shock. Besides this, his fortune, which had been ample, was now greatly reduced. His lands were devastated; his papers and library were burnt; his implements of husbandry destroyed; and his stock seized and driven away. He was now obliged to depend, for a season, upon the assistance of friends, for even the necessaries of life. From the time of his imprisonment his health began to fail him; nor was it particularly benefited by his release, and a restoration to the society of his friends. He continued to languish for several years, and at length died at his residence, at Princeton, on the 28th of February, 1781, in the fifty-third year of his age. “Young gentlemen, (the students of the college,) another of the fathers of learning and eloquence is gone. He went before in the same path in which you are now treading, and hath since long presided over, and helped to confirm the footsteps of those who were here laboring up the hill of science and virtue. While you feel and deplore his loss as a guardian of your studies, and as a model upon which you might form yourselves for public life, let the memory of what he was excite you to emulate his fame; let the sight of what he is, teach you that every thing human is marked with imperfection. “At the bar he practiced for many years with unrivaled reputation and success. Strictly upright in his profession, be scorned to defend a cause that he knew to be unjust. A friend to peace and to the happiness of mankind, be has often with great pains and attention reconciled contending parties, while he might fairly, by the rules of his profession, have drawn from their litigation no inconsiderable profit to himself. Compassionate to the injured and distressed, he hath often protected the poor and helpless widow unrighteously robbed of her dower, hath heard her with patience, when many wealthier clients were waiting, and hath zealously promoted her interest, without the prospect of reward, unless he could prevail to have right done to her, and to provide her an easy competence for the rest of her days. “Early in his life, his merits recommended him to his prince and to his country, under the late constitution, who called him to the first honors and trusts of the government. In council be was wise and firm, but always prudent and moderate. Of this be gave a public and conspicuous instance, almost under your own observation, when a dangerous insurrection in a neighboring county had driven the attorneys from the bar, and seemed to set the laws at defiance. Whilst all men were divided betwixt rash and timid counsels, he only, with wisdom and firmness, seized the prudent mean, appeased the rioters, punished the ringleaders, and restored the laws to their regular course. “The office of a judge of the province, was never filled with more integrity and learning than it was by him, for several years before the revolution. Since that period, he hath represented New-Jersey in the congress of the United States. But a declining health, and a constitution worn out with application and with service, obliged him, shortly after, to retire from the line of public duty, and hath at length dismissed him from the world. “In his private life, he was easy and graceful in his manners; in his conversation, affable and entertaining, and master of a smooth and elegant style even in his ordinary discourse. As a man of letters, be possessed a superior genius, highly cultivated by long and assiduous application. His researches into the principles of morals and religion were deep and accurate, and his knowledge of the laws of his country extensive and profound. He was well acquainted with all the branches of polite learning; but he was particularly admired for a flowing and persuasive eloquence, by which lie long governed in the courts of justice. “As a Christian, you know that, many years a member of this church, he was not ashamed of the gospel of Christ. Nor could the ridicule of licentious wits, nor the example of vice in power, tempt him to disguise the profession of it, or to decline from the practice of its virtues. He was, however, liberal in his religious principles. Sensible, as became a philosopher, of the rights of private judgment, and of the difference in opinion that must necessarily arise from the variety of human intellects; he was candid, as became a Christian, to those who differed from him, where he observed their practice marked with virtue and piety. But if we follow him to the last scene of his life, and consider him under that severe and tedious disorder which put a period to it, there the sincerity of his piety, and the force of religion to support the mind in the most terrible conflicts, was chiefly visible. For nearly two years be bore with the utmost constancy and patience, a disorder that makes us tremble only to think of it. With most exquisite pain it preyed upon him, until it reached the passages by which life is sustained: yet, in the midst of as much as human nature could endure, he always discovered a submission to the will of heaven, and a resignation to his fate, that could only flow from the expectation of a better life. Grave marker of Richard Stockton, a signer of the Declaration of Independence in the cemetery of the Princeton Society of Friends (aka Quakers) church built in 1726. 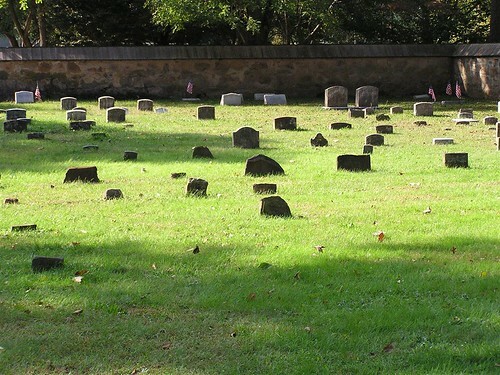 Cemetery of the Princeton Society of Friends (aka Quakers) church built in 1726.